On Saturday Mrs SC and I went to the Royal Museums of Fine Arts here in Brussels to see their Chagall Retrospective. We had some idea that this weekend would be the final opportunity. It turns out, though, that the exhibition is running for another month yet. It was very impressive to see in one place so many of Chagall’s paintings – 200 says the exhibition brochure. So much intense colour. I just found a quote from Picasso. He said, after his close friend and rival Matisse, Chagall was the only living artist who “understands what colour really is”. A little bit of a backhanded compliment that – I wonder if Chagall appreciated it. I wonder if Chagall would have appreciated this exhibition. Well, of course he would. The reverence for his art now, contrasts strongly with the indifference and contempt he faced for many years. 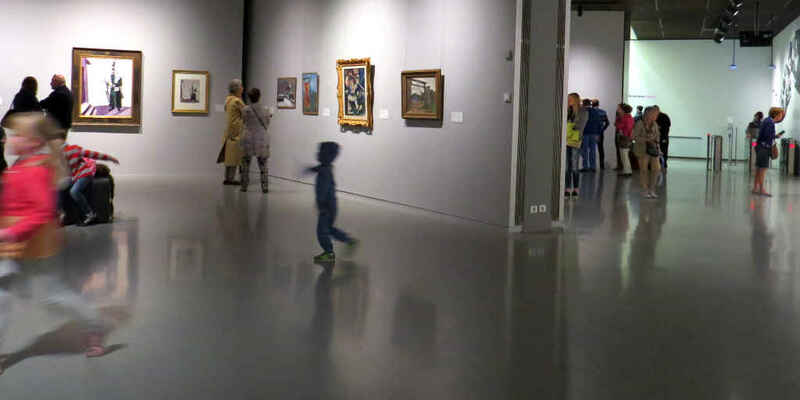 Indifference first from a broad public in his early years (though not among fellow artists and not at home in Vitebsk). 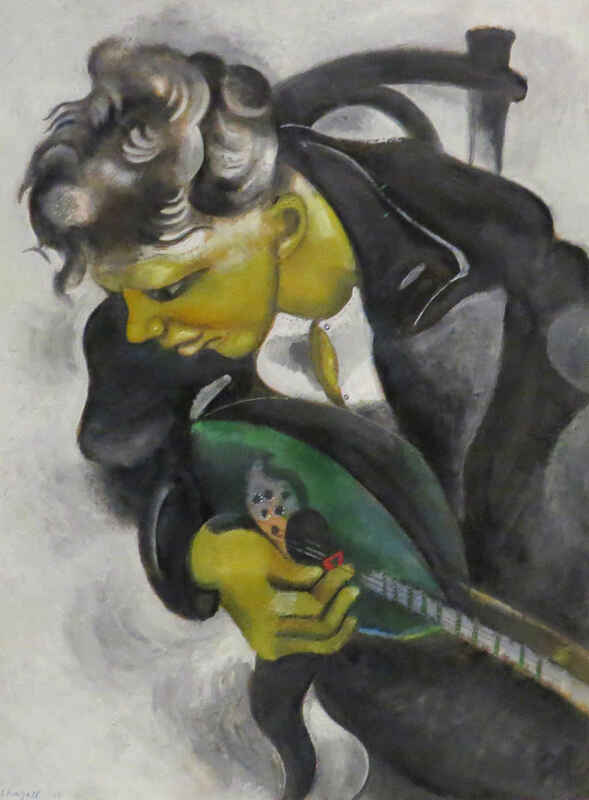 But indifference was less of a problem than the contempt, as his art was rejected in Revolutionary Russia and as Nazism grew in the 20s and 30s. 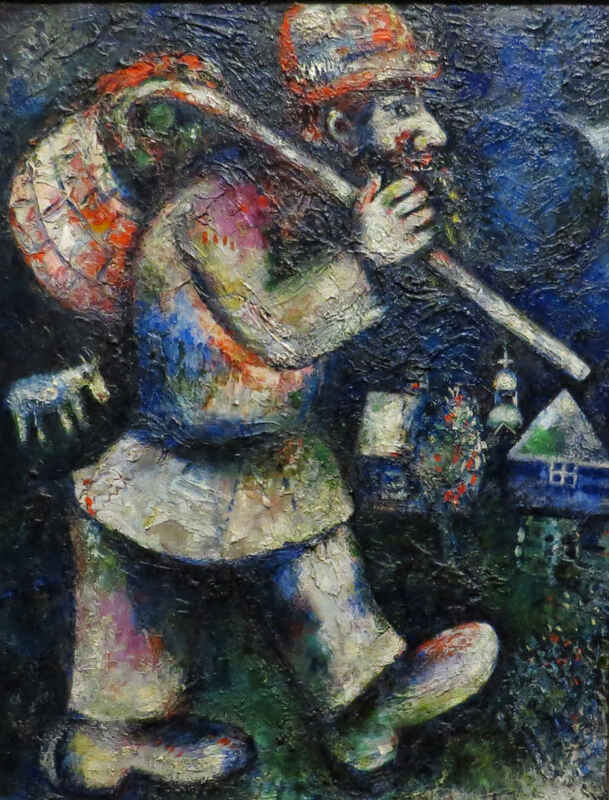 Chagall’s art was “green, purple, and red Jews shooting out of the earth, fiddling on violins, flying through the air … [an] assault on Western civilization”. On the other hand, the exhibition hall is buried in the cellar of the Museum. (What would Chagall have thought about all the artificial light?) And to get to the exhibition visitors have to pass a foul smelling vestibule that reminds you Brussels also boasts a Sewer Museum. Perhaps the smell was a advert for that? But then you get to the art and the all rest is of no account. As there were signs at the museum entrance showing crossed over cameras I assumed photography was forbidden until I saw somebody filming. I asked, and was told I could take photos for my own use as long as I didn’t use flash. 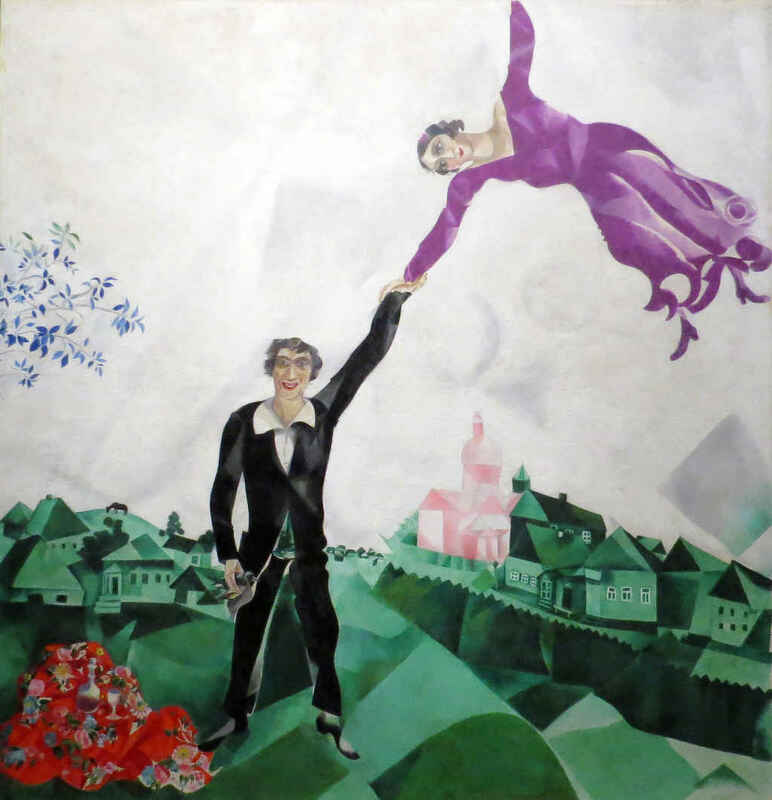 There were pictures from every phase of Chagall’s artistic career, from about 1909 until the 1980s. Personally I found most interesting the ones from about 1912 through to the 1940s. (The later pictures from his time in the south of France seem over decorative to me.) But the range of his art from a sort of post-impressionist style reminiscent of Gauguin and van Gogh, through Cubism, Expressionism and on into a naïve Surrealism is compelling. And it’s easier to appreciate it when you see so many works all together. 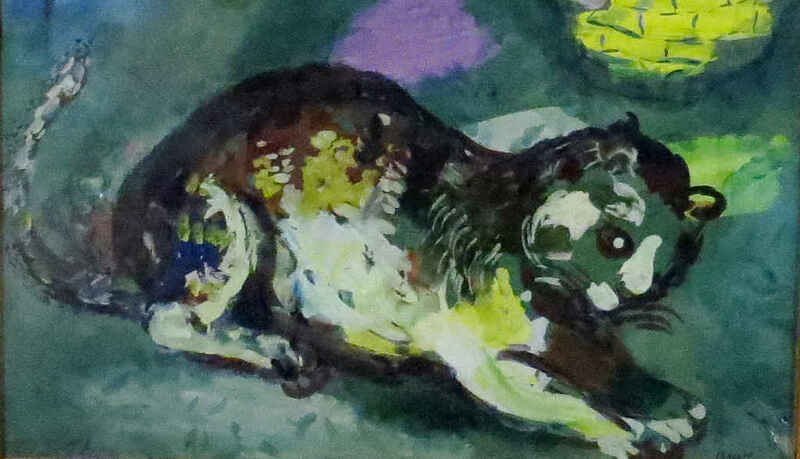 The only thing missing from the exhibition really was any example – or even any photograph – of Chagall’s stained-glass. 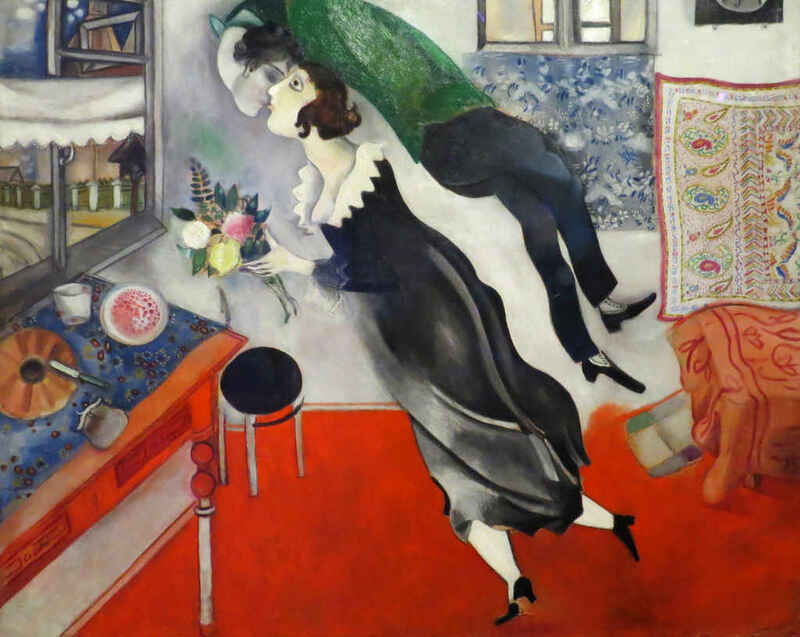 But I forgive this because I know it was Chagall’s opinion that his glass should be seen with the moving light of day behind it, so that it changes over time and depending on the weather. Once upon a time when I was in my 20s, I stayed at my father’s home in Kent. A village called Five Oak Green. I was to take care of the place while he and my stepmother Doris were on holiday. Before they left Doris said she thought I might be interested in the church in the next village. For reasons of domestic tranquillity, and because she simply wouldn’t understand what I was getting at, I let the Jew reference pass by. Doris went on to say that the windows had been put in to commemorate the daughter of the Lady of the Manor. The young woman drowned in a sailing accident off Rye. Her husband – “Harry Goldsmid, you know” (I didn’t) – was the one who had brought in “the Jew”. That cat hated me. With reason, it must be said. Anyway, once the morning’s struggle was over there wasn’t much to keep me in the house and so I walked a lot, exploring the byways around the village. One day I walked across to Tudeley to have a look at the church. Inside, though, all other considerations just fall away. You stand in the wonder of the blue light streaming through twelve fantastic stained-glass windows. All clearly the work of Marc Chagall. A little nosing around shows that while Sir Henry d’Avigdor-Goldsmid may have paid for the windows it was his Christian wife and daughter who chose Chagall. They had seen and fallen in love with the artist’s stained glass in Paris. It was Chagall’s windows for the synagogue of the Hadassah Medical Centre in Jerusalem. They were exhibited in Paris in 1961. Then the daughter, Sarah, was drowned in 1963. The mother, Rosemary, tracked Chagall down and persuaded him to create a commemorative window for the church. Chagall was reluctant at first, but finally agreed. When he came to see the window installed in 1967 he is supposed to have said: “C’est magnifique! Je les ferai tous!” (“It’s beautiful! I will do them all!”) All the windows that is. The last window was put into the church in 1985 – which may have been after I was there – soon before Chagall’s death. It’s strange to think about the windows at Tudeley now and how I came to see them for the first time. Here I am in Brussels, viewing an exhibition that focuses on Chagall and his extraordinary life. Vitebsk, Paris, Berlin, Moscow, Paris again, New York, the Côte d’Azur… In his art he portrayed himself, among other things, as the Wandering Jew of folklore. And my mind slips back 30 years or more to that summer, and then suddenly forward again ten, twelve years. Now I am looking down on Kent from the window of an aircraft flying into Heathrow. It’s a crystal clear October morning and my eye follows the route of a railway line and suddenly I realise I’m looking at Five Oak Green and Tudeley, and a little beyond, Tonbridge where my father is dead in a funeral home waiting for cremation. Is it me or is it Chagall? Neither I suppose – it’s just human nature. But Chagall was able to capture in his art the way the mind can hop and skip across time and space and mix fact and fancy. Even fly through the air. In the museum, the voice on the audio guide is reading an English text. It’s clearly been translated from French and originally written by an art historian with a definite idea of what Chagall’s art means – but I’m not so sure. 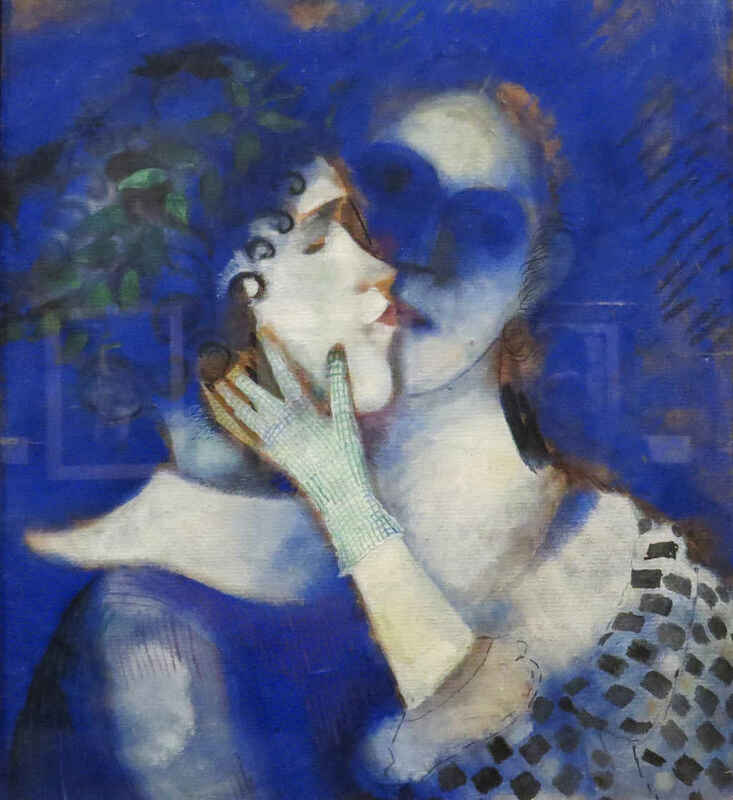 I hear her saying “anger… terror… horror”, but I find it difficult to see these emotions in Chagall’s work. I see joy and happiness, humour, innocence and bemusement. At worst I see faces without expression. 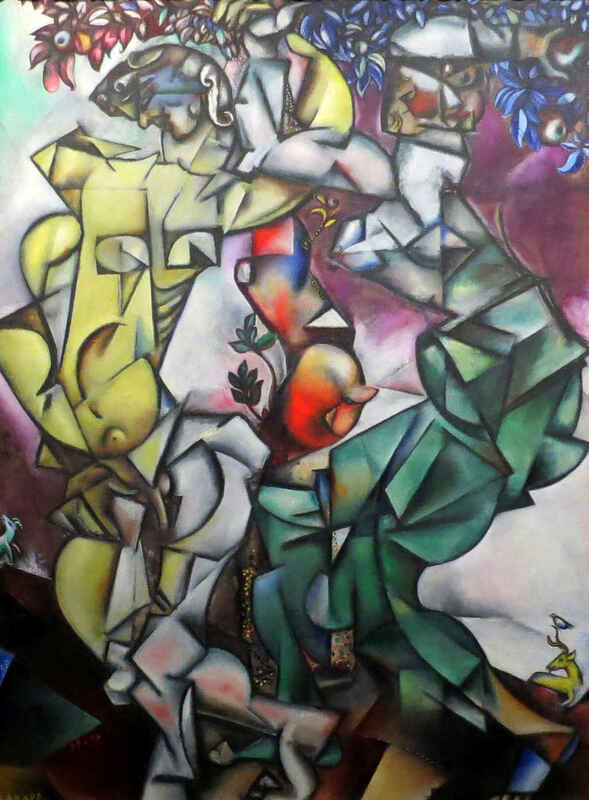 Chagall’s colour symbolism is beyond me – so green means illness? OK, if you say so, voice from the machine. The falling angel, burning in red with one black eye gazing back at the viewer, now that I find more comprehensible, but I don’t see fear. At the end of the exhibition, passed the turnstiles at the exit but before you reach the exhibition shop… (Chagall prints on micro-clothes to dust your computer screens – artistic and practical!) Before the shop is an area set aside for visiting school kids, paper and crayons and an exhibition of children’s work inspired by Chagall. Acrobats and lovers and figures flying over rooftops, angels and musicians and people with Janus faces. The kids seem to have distilled Chagall’s essence – even if they can’t quite do the colours. But then, with both Matisse and Chagall gone, who now understands colour? All illustrations are from my own photography except the picture of the east window at All Saints’ church Tudeley, which links to the original source. I took more photos than just the ones included in the article above. To see all of them in a little gallery, follow this link. Originally published on the separate Stops and Stories website. Transferred here 6 February 2017.